To quarry Stone is a major engineering and logistical exercise whether it is a below ground or out of the side of a mountain. Initially they need to make new roads to transport the huge blocks of material. This in itself is very difficult as the new roads in many instances have to be carved out of the side of the mountain and be sufficiently stable to take blocks of up to 30 tons. The topography climate (how many months of the year is the quarry accessible due to snow) human resources, are all taken into consideration and have cost implications for a viable stone. 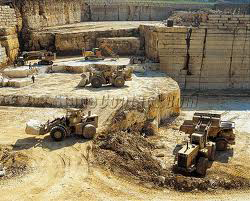 The geological composition and structure of rock will dictate the method and the equipment used to extract the blocks. Although originally a man intensive heavy industry. Modern machinery and increased scientific techniques. are speeding up and making safer the extraction of stone. In many villages close to large quarries it is not uncommon to see men with missing limbs. Fortunately with modern quarrying accidents are now a rare event. The natural environment in most Western countries is taken into consideration and agreement on the visual impact in conjunction with the geological needs dictated by natural planes and bed depths. leads to the development of the quarry. The vertical and horizontal cut faces take on a beauty all of there own and can be architecturally imposing.